Football has long been considered a men's game, but 10-year-old fifth grader Chen Chang is determined to prove otherwise. The Chinese women's football team's recent good showing at the 2015 FIFA Women's World Cup in Canada, has greatly inspired Chen. At her training sessions with other Chinese and some expat girls at Chaoyang Park on Saturdays, Chen's agility and fairly sophisticated techniques give her the edge, despite being one of the youngest and shortest in the group, which can prove challenging. She kicks, passes, punts, laughs and sweats on the field. "I love football. My father likes it, and I have been into playing football and have been training since I was a little girl," said Chen. "At our school, many students like to play football, including girls." With China having reached the quarterfinals of the World Cup, the country is sitting up and taking notice. The sport is growing around the country, and more young girls are showing an interest. Experts predict that instead of men's football, China's hope of standing out in international competitions might lie with the women's team. But many parents still believe that football is not a game for girls. Along with the lack of a sophisticated and consistent program for women's football in the education system, girls' football, while promising, faces an uncertain future. "I think girl players are more likely to stick together, while boys might just aimlessly kick the ball around," said Chen, who is usually the striker of her team. Chen says kicking around a ball and running on the field makes her feel great. "Sometimes my troubles just go away." Whenever the students are asked to talk about their dreams, Chen says she dreams of becoming a member of the national football team and to win the World Cup. Then she wants to retire in her 30s to become a cartoonist. Chen's mother Pan Hua tries to plough as much as she can into her daughter's sporting ambitions, but doesn't think it's realistic for her to go all the way. Pan, a college professor in television media, told Metropolitan that the family used to live in the US and returned to Beijing two years ago. One of the problems was finding a place for Chen to play football. "Resources [for girls playing football] are very limited," Pan said. It's much easier for Chen's twin sister, who likes to dance, to find classes to attend and activities to participate in. There's only an all-boy football team at Chen's school, and the number of clubs that provide girls' training in Beijing is limited. When she joined a local youth club, China ClubFootball, there were only two girls in the team. Among the teenage players at the club, less than 10 percent are girls. "This semester, we are glad to hear from the school that the district education authorities are attaching more importance to girls' football," Pan said. Chen's school, Baijiazhuang Elementary School in Chaoyang district, is one of the dozen elementary schools in Beijing selected as pilot schools to launch a football program, along with 10 middle schools. 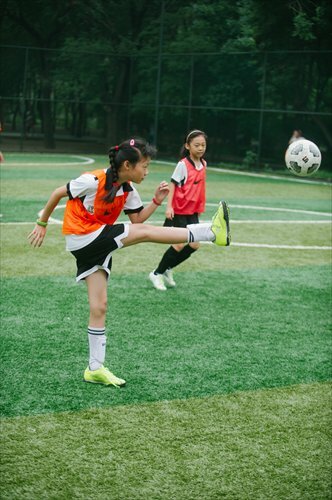 The 22 schools officially started football training in April this year and have a football session each week as part of their curriculum, the Beijing Evening News reported. In the past year, more than 300 gym teachers from schools in Chaoyang district have been trained in football, and a new set of textbooks Sunshine Football has been distributed. All the elementary schools in the district are required to have a 7-a-side team and the middle schools, a complete 11-player team. This is part of the efforts made to develop "campus football" nationwide. In January, a "school football leading group" was established by China's Ministry of Education, along with five other central government departments, the Xinhua News Agency reported. The purpose of this group is to encourage campus football development by promulgating laws and policies and providing more resources. However, Pan finds the current efforts "too utilitarian," and elite-oriented. Despite the efforts of developing campus football, girls' football is often neglected. "It's just for the national women's team. But when we were in the US, we saw a larger football-playing population and faculties. Football is much more popularized." Pan thinks it's better for her girls to follow their interests instead of forcing them to attend all kinds of Olympic math tutorials or piano lessons. "Sports reflect a more humanistic spirit, which is connected to a person's character and health," said Pan. She said that after years of playing football, her daughter has a more positive attitude and is more outgoing, traits that will stand her in good stead in future. Pan's opinion is shared by Gao Qian, mother of 10-year-old Miaomiao, another girl who enjoys her football training. "Despite her good grades and gym performance at school, Miaomiao is still a girl with low self-confidence," said Gao, "but now she is gradually willing to fight, and exhibit her good qualities and achievements." 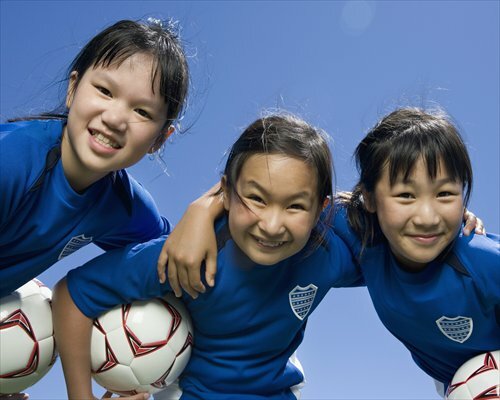 Pan and Gao say they are a less common breed of Beijing parents, since most Chinese parents still think it's unusual to allow girls to play football. Last summer when Miaomiao trained with a team comprising mostly boys, Gao noticed that all the parents, even those of the boys, were overly protective of their children. They appeared nervous about small collisions and injuries. "Chinese parents don't usually let their children get hurt," said Gao. "After training for two years, Miaomiao is fine with small injuries. She just gets up and keeps running." "We'll let her train for as long as she likes it," said Gao. Laura Scully, a British coach with China ClubFootball, who is responsible for the training sessions for girls aged 3 to 15, has made some interesting observations between girl and boy players. "Girls are ready to listen, and boys just want to kick the ball and score," Scully said. "Girls are a lot shier and less confident," she added. Between the expat girls and Chinese girls, Scully finds the latter are even more attentive listeners. Due to the small number of girls playing football in Beijing, and few opportunities to compete, it's hard to get girls to play against each other, said Scully. "Like everywhere in the world, girls don't play football," she said. "When I grew up, my parents didn't want me to play football." But Scully is glad to see more Beijing parents of girls becoming pro football. The World Cup has inspired youngsters. "All the girls came in and talked about [the women's World Cup games]," she said. Scully said girls are watching more women's football games - evidence that the attitude toward football is largely changing. Since coming to China, Scully said she feels that the Chinese public's belief that they are not a strong footballing nation should and will change. "I think Chinese kids are good at football, it just takes time." "Women's football, not in China but all around the world, is not as publicized as men's football. It will motivate a lot of people if China wins the women's World Cup in future." According to Scully and the children's parents, despite the fact that many girls are interested in the sport, they are physically better developed at certain ages than boys to play the game, and they are often better team players, girls' football education still falls behind that of boys. "I won't agree to her becoming a professional, because I think in our country's [player training] system, choosing this profession means dropping academics, which is the most important for children," said Gao. Liu Jingjie, a football commentator on sports channel CCTV 5, echoes Gao. "Parents worry about career development and whether playing football will affect young people's studies," said Liu. He told Metropolitan that for female youth football in China, the biggest problem is deciding on the footballers' future plans. It doesn't pay well to be a female football player in China, even at the highest level, according to Liu. The absence of facilities, including proper insurance and medical support, have been puzzling for female players. Liu said the reason for this is that sponsors and clubs struggle to make money from marketing women's football, where there's less public attention, and no fan base. "Our percentage [of women playing football] is much less than the US, Japan and Europe," he said. Since there's a lack of sponsorship, Liu believes the key to developing female football is to provide more national fund and guidance from government. Many provinces and cities don't attach enough importance to girls' football, and the education system is still oriented toward boys, said Liu. "Girls' football education is marginalized. The competitions are more like performances, and the classes are usually showy but not practical." Temporary football fever brought on by the Women's World Cup is not the solution, said Liu. In 1999, the Chinese women's team were the runners-up, but the excitement brought on by that, according to Liu, faded quickly. Still, Liu has more faith in the future success of female football over men's, but said it all boiled down to youth training. "I think China's female football team will win a World Cup 30 years before the men," said Liu. "The international female football structure is changing, with some former top teams declining. More young, fresh teams like China's will have more opportunities, as long as we improve the publicity of girls' campus football and let people know that there's nothing wrong with girls playing football."